Acoma Pueblo, also known as "Sky City", is located 50 miles west of Albuquerque near Enchanted Mesa and is one of the oldest continually inhabited sites in North America. The area is home to particularly good clay, which potters mix with crushed potsherds. This results in the ability to produce very thin, lightweight yet strong pottery. 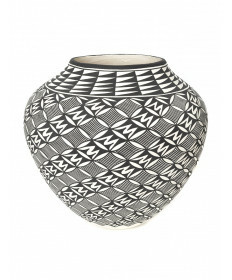 Traditional designs range from complex geometrics to abstract animal, floral and figurative forms. Coloration consists predominantly of black and white and black, white and orange although other colors such as yellow and red also appear infrequently. 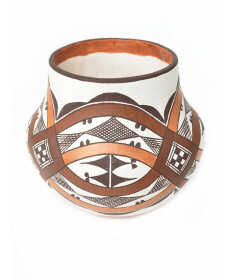 Acoma clay is grey in color and potters achieve their white surface with a slip of Kaolin, a naturally occurring chalky material that is a brilliant white. Black can be made from crushed hematite and/or the liquid from boiled wild spinach. The two materials are often mixed together. Other colors usually come from other clays. Laguna Pueblo is located 42 miles west of Albuquerque between Acoma and Isleta Pueblos. 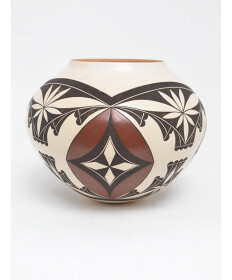 Laguna pottery shares similarities with Acoma pottery in that is typically covered in white slip with black or black and orange geometric decoration. 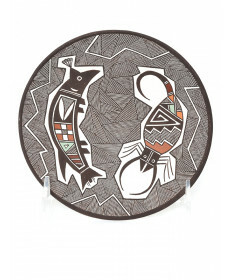 It is usually slightly thicker and the designs tend to be bolder than Acoma pottery. 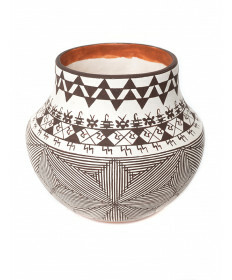 Laguna pottery might have died out in the late 1960's if not for the efforts of Laguna artist Evelyn Cheromiah, who, in the 1970's, researched ancient techniques and designs to revive the art and then went on to teach other Laguna artists.